If you love canoeing, kayaking, camping and the great outdoors, this CD is for you! You'll laugh, cry, sing along and maybe even dance to "The Bear Barrel Polka". The perfect musical accompaniment to play on the way to your put in. Some say it is "Paddle Songs, Volume II"; some say it is a follow up to the acclaimed first paddle songs CD, "True And Deep". Add these 10 new all acoustic songs about paddling, love, friendship and the great outdoors to your collection and put your own label on it. Recorded with Nashville's best. Get ready for your next trip! 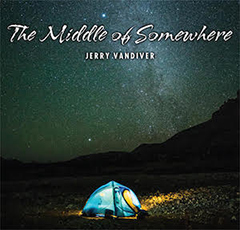 Jerry Vandiver has brought two of his passions together in creating this unique collection of songs that speak to the paddler's soul. Featured on True And Deep are 2011 CCMA Female Vocalist of the Year Victoria Banks and Grammy Award-winning Native American Artist Bill Miller on Native flute.